Today, Tutankhamen is the best known of all of the Egyptian pharaohs. This is because in 1922 Howard Carter and George Herbert discovered his undisturbed tomb in the Valley of the Kings. The discovery made news worldwide because it was loaded with amazing artifacts. The wealth found in King Tut's tomb astounded the entire world. The vast majority of the remains were left intact inside the tomb, which is in Luxor, Egypt. The most important artifact discovered inside the tomb was King Tut's burial mask. The burial mask is housed in the Egyptian Museum in Cairo, where it is kept in an air conditioned room. Today, the tomb is associated with a curse. This is largely to do with the bad luck that has been experienced by all of the people who opened the tomb. There were many immediate deaths. In fact, the person who financed the project, Lord Carnarvan, died of a mosquito bite just a few weeks before the tomb was opened. Tutankhamen was born in 1341 B.C, the son of the Egyptian pharaoh Akhenaten and his sister wife. He was the 12th king of the 18th dynasty. King Tut ruled during the period historians call the New Kingdom. Tutankhamen original name was Tutankhaten which means “Living Image of Aten.” Aten was the name of the Egyptians god who had recently been adopted by the Pharaoh Akhenaten. Before long many people were angered by his new religion. In an arranged marriage, Tutankhamen was married to Ankhesenamon, his sister. Shortly after their marriage they set up a home in the capital city of Amarna, but a rebellion against the new religion forced them to move to Thebes. The power struggle between old and new religions would follow Akhenaten throughout his 17 year reign until he died in 1332 B.C. Upon his death the 9 year old Tutankhamen became the pharaoh. In the beginning, Tutankhamen was too young to rule so he was supplied with the very best advisers, including a man who was probably his grandfather, Ay. Ay's official title was vizer. Also advising Tut was Horemheb. 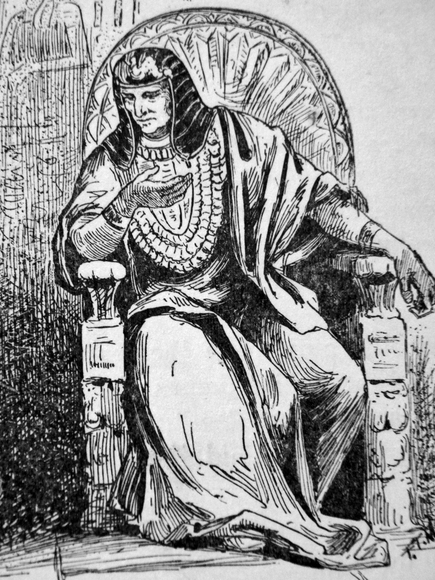 Horemheb was Egypt’s top military commander. Historians believe that Ay persuaded the young pharaoh to change his name from what had been Tutankhaten to Tutankhamen. This was to show his people that he wanted to return to the old religious ways. His new name meant, “Living Image of Amun.” Tutankhamen changed his name for the sake of peace and prosperity. He told his people to stop worshiping Aten and return to worshiping the old god Amun. Tutankhamen and his wife had two children and they were both stillborn. During his reign he is credited with stabilized the government, and restoring many of the old temples. Tutankhamen died in 1323 B.C., at the age of 19, after ruling as the pharaoh for 10 years. It is believed that he died from a wound near the left ear. Historians beleive he either died in battle or died from some kind of accident, and that he was not assassinated. In the same tomb, the Egyptians buried Tut's two stillborn children in miniature coffins. Painted across the walls of the tomb was a mural that told the story of Tutankhamen funeral and his journey into the afterlife. Almost immediately following his death his wife Ankhesenamon startled everyone by offering herself and the country of Egypt to Shuppiluliumash, king of Hittites. Eventually, she married Tutankhamen's adviser and probable grandfather, Ay.